Welcome to our event. Thank you very much always for coming to our shop. 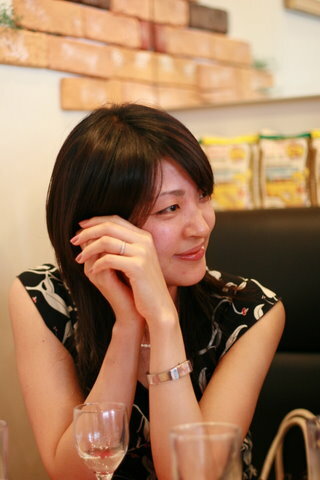 I am Keiko Ochi one of the founders of Sakaeya. I always think how a kimono is beautiful and gorgeous. 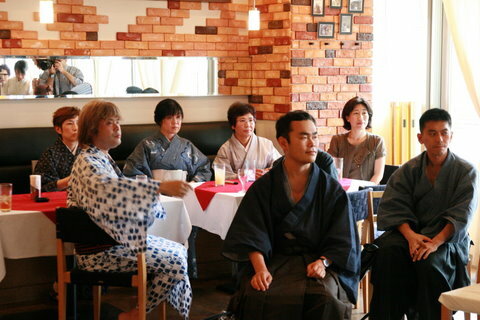 Kimonos suit everyone, regardless of nationality. I’m so pleased so many of you have decided to join us today. Actually, when I was young I could not image foreigners would enjoy wearing kimonos. Because, at the time I was attending elementally school, Japan was fighting against the U.S. and several European countries during World Ward 2. Even through I lived in Shikoku, a large island south-east of mainland Japan, we encounters attacks there as well, and our family would run for our lives, one time even losing sight of each other. Somehow we all managed to get to and stay at a relatives house in the coutry-side. The next day the eight of us walked back to our house by foot, walking for over an hour. Fortunately, our house hadn’t burned down, but even today I remember how frightened I wa. During the war, we could not turn on the light—even during dinner—because it was said that American soldiers would spot us and attack. Therefore we put a black cover on the light and ate very simple food underneath this dim light. My parents ran a liquor shop shop. So when we ran out of food, my father would go to a farmer’s house and ask to exchange liquor for their food. One day, my father announced “ this is the last whiskey” and went to exchange it for rice. Whenever I remember this, I can’t help crying. Today, Japan is a very prosperous country where we can enjoy things like colorful and fancy Kimonos and Yukatas, but in those days the main concern on everyone’s minds day after day was finding enough to eat. We were barely surviving. When I was 5 years old, we moved to Manchuria, or what is now known as Northeast Asai, to look for a new and peaceful way of live. But in fact, life was not easy there either. Now China and Japan have a good relationships, but in those days the two countries had a very complicated relationship. So, even though I was living abroad, I didn’t have the opportunity to immerse myself in a new culture and enjoy living abroad, as many international travelers today can enjoy. That is why, when I see foreigners come to Japan and enjoy wearing Kimonos and Yukatas, I can’t help but think at how peaceful the world has become. In 1945, the Showa emperor declared Japan’s defeat in war to the citizens of Japan over radio. As a 11 years old. I believed Japan would win so I was extremely surprised to hear that we had lost. It’s been almost exactly 62 years since that day. 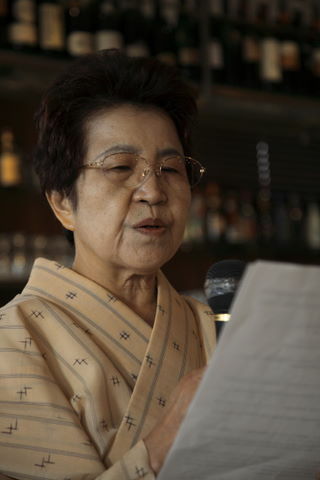 The reason Japan was able to restore itself so strongly must surely because many survivors of the war believed they had to work and study hard not only for themselves but for the victims of war, who lost their lives for their country. People who were born before the war, like me, will never forget those who lost their lives in the war. In fact my late husband, Kahori’s father, was in the midst of air force training when Japan surrendered. But had the war continued, perhaps we would not have had gotten the chance to marry. My late husband’s old brother, in fact, fought in Laos in southeast Asia, where he was killed in action. 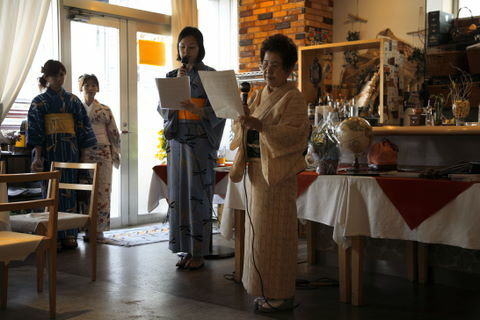 If those who lost their lives in the war could see our party today, I think they would be pleased to know the people are coming to Japan not to fight, but because they are attracted to Japanese culture, like Kimonos. It was 48 years ago, when my husband and his younger bother, OCHI Isthuto, and I started our Kimono shop, Sakaeya. It was just around the time when Japan was making its first step into becoming an economically stable country. During the war, we ware not allowed to were nice Kimonos because that was a slogan during those times, “luxury is the enemy”. And the rationing system made it difficult get new clothes. Perhaps especially people were not allowed to wear nice clothes during this time, once the economy became better, many people wanted to wear nice clothes, and nice kimonos. So, Sakaeya became very popular. However, after the bubble economy crumbled, luxurious products like the kimono were very had to sell. 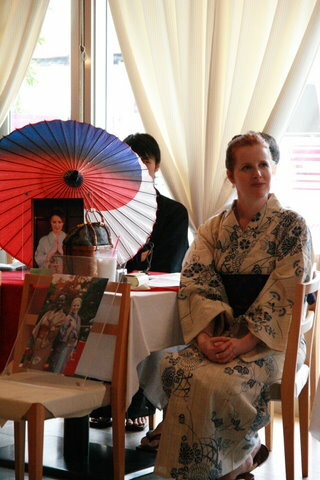 Four year ago, we started sell inexpensive second hand Kimono and last year we moved to a new shop. And now it is our one year anniversary at this new location. From the perspective of a 73 years old woman, and someone who’s experienced war, no human should point a weapon at another human, no matter what. I would like to spread a message of peace to the world from my small kimono shop. 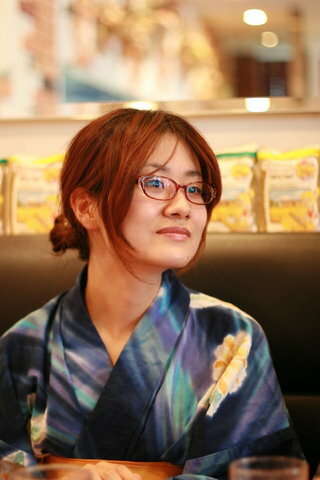 My slogan of peace is “Choose Kimonos, Not Weapons”. Thank you for listening, and thank you again for joining us today.